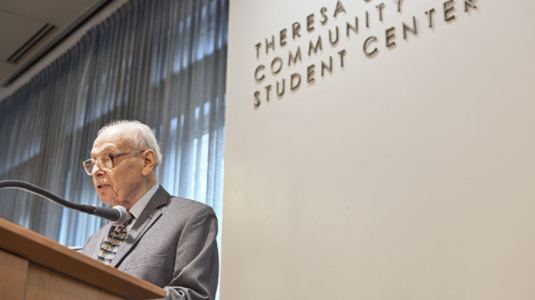 The New School mourns the passing of Eugene M. Lang, a businessman, educational visionary, and New School trustee who paved the way for the transformation of the university’s Eugene Lang College, his namesake institution, into a leading liberal arts school. He was 98. A trustee of The New School since 1978 and life trustee since 2011, Mr. Lang was the heart of Eugene Lang College, imparting both the material support and foundational values that elevated the school from small undergraduate program to distinct liberal arts college within the university. The school, formerly the Seminar College, was renamed in his honor in 1985. Since that time, Eugene Lang College has grown dramatically: The college has increased enrollment to 1,500 students, it has expanded into innovative areas of study, and it now offers BA/BFA dual-degree programs in art and design (with Parsons School of Design) and music (with the School of Jazz). Through all these changes, Eugene Lang College has continued to embody the values of its founder: a deep commitment to academic excellence, civic engagement, and seminar-style pedagogy. Mr. Lang was presented with an honorary degree by The New School in 1987. Mr. Lang began his career in business in the early 1950s, founding REFAC Technology Development Corporation, an early leader in the global production and distribution of precision manufacturing products. The business earned Mr. Lang widespread respect from his peers in both business and government: Forbes Magazine called him “the quintessential entrepreneur”; Nation’s Business said he was “a father of innovation”; and President John F. Kennedy gave him the prestigious “E” Award for entrepreneurship. Mr. Lang’s international expertise also earned him a place on numerous trade and investment missions to Australia, Japan, France, India, Myanmar, New Zealand, and the Philippines. In addition to his success in business, Mr. Lang made his mark in philanthropy. He founded his namesake foundation in 1963, barely a decade after beginning his first company. By 1997, Mr. Lang had divested himself of all business interests, spending the remainder of his life focusing on work for the public good; he took a remarkable leadership role in the areas of education and health. In 1996, President Clinton awarded him the Presidential Medal of Freedom, this country’s highest civilian award. In 1981, while speaking at a sixth grade graduation at P.S. 121, the elementary school he himself attended, Mr. Lang pledged to pay for a college education for any members of that class who went on to graduate from high school. His pledge became a media sensation, and Mr. Lang soon found himself on the front page of the New York Times. He later established the I Have A Dream Foundation to help manage his commitment to send that original class of “Dreamers”—and thousands of other students—to college. Of the students in the original 1981 class, an impressive 90 percent graduated from high school and 60 percent attended college. In 2001, Mr. Lang founded Project Pericles, an organization that promotes preparation for responsible citizenship as a curricular component of higher education. Born to immigrant parents in 1919, Mr. Lang grew up in New York City. During the Great Depression, he attended public schools and, at age 15, was admitted as a scholarship student to Swarthmore College, an institution he supported throughout his life. He earned his degree in economics in 1938 and was employed as a writer of business reports and as a production planner for an aircraft parts company. He and his late wife, Theresa, were married in 1946. The New School extends its condolences to Mr. Lang’s sons, David and Stephen, and his daughter, Jane. In lieu of flowers, the family suggests that contributions may be made to the Eugene M. Lang Opportunity Awards Endowment Fund, one of Mr. Lang’s many programs established at the college.